that s*cks. this is why i really hate buses. Not because because buses aren’t awesome. But because they can be rerouted any time and they don’t have consistent routes and consistency in labelling even for locals who understand the system buses and their constant rerouting and change is a nightmare. Trains usually have much more consistency in routing, better signs and labels. As for f*regate don’t get me started on the sm*rt card and f*regate waste of money! That’s a separate st*pid waste of money from our r*diculous government that seems only to care about giving money for recurring software revenue and paying tr*nsit police! May be Translink should have asked Paris’RATP (the metro). Way back when they designed a basic smart card, the Navigo, with the help of Roland Moreno. Innovatron, his company, worked with the RATP to create the Navigo card. It isn’t as complex as other transit cards that are also a credit card and an electronic purse, but sometimes “less is more”! RATP is the 49% owner of GEST the Firenze tram system operator. 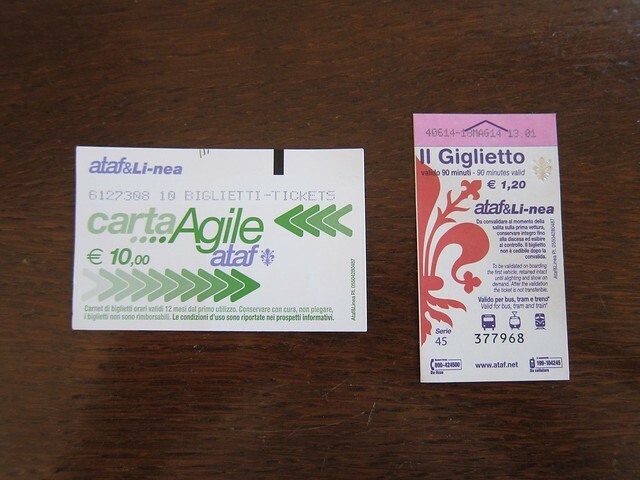 The CartaAgile works systemwide with both ataf and Li-nea. It is a stored ride card that uses a memory chip and it was a proximity reader error that caught me. I would have been safer with a time defined travel card “touristico” but could not find anyone to sell me one on a Sunday, when the ATAF office is closed. The transit company can’t stop them..Mind you, the unpaid fares represent 3% of all the rides. As usual only the subways is concerned. Nobody talk about buses, trams etc. Stockholm transit was considering installing high gates, as in Lyon. A member of the official dodgers group went to Lyon and made a video showing that these gates couldn’t prevent people to sneak without paying. “at least one fare-beating dog trained to open the barricades for its owner.